Here is your first opportunity to get a glimpse into the creative workings of SoHo Exchange. Currently, we are working on Fall/Winter 2010 collection. And per usual, we are under the pressure. The runway show is January 27, 2010. In the ideal world we would have 2 looks completed by December 1st! Eeeeek! That is a week away…well here we go. The inspiration for this collection is the “Patrick Kelly Woman” – Where is she now? She is 20 years older, but feels like she is still 21. She cares about our planet and wants to include a green lifestyle into her fashion. Our collection begins with the vinyl billboards you pass on the highway every day. 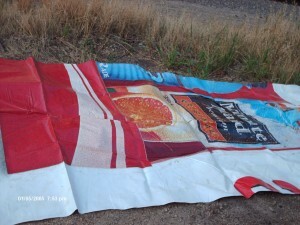 The billboards start out 50′ x 15’! They are huge. So during the warm, summer months in Minnesota, we cut our inventory down to more managable pieces. So that we can work away all winter long…until we get a huge warehouse space, this is what we have to do! SoHo Exchange needs 8 models for the Commingle Fashion Show, January 27, 2009. If you are 5’9″or taller and can strut, please email designers@SoHoExchange.biz immediately with a current headshot. Yep, it was 6 years ago this week that www.SoHoExchange.biz was launched. And we are still on a learning curve, but having the time of our lives! Thanks to all our supporters, clients and motivators! Stay lookin’ cute! Did you know SoHo Exchange has an Etsy shop? We have a new white, strapless dress w/brooch available. Check it out and buy, buy buy! For ticket information and further details please email soho@sohoexchange.biz. It has finally hit newsstands! Rush out and get your copy of the April Issue of Twin Cities Luxury and Fashion magazine! 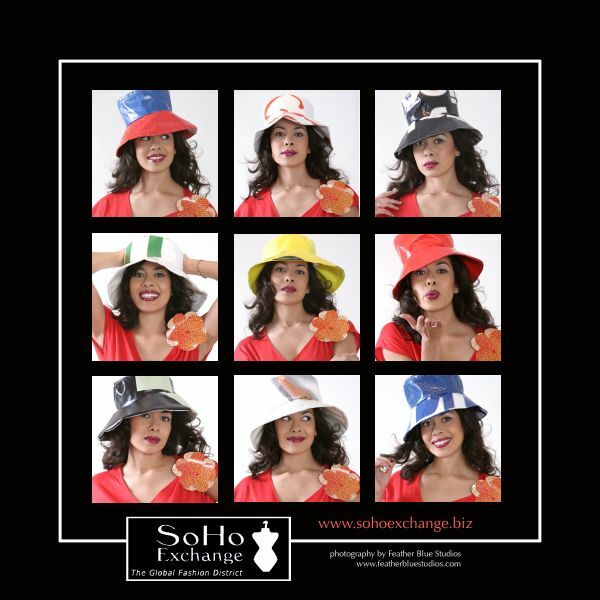 There is a great article featuring Amy Michielle, SoHo Exchange and SHE Signature rain hats on page 58. The magazine can be found in most retailers featuring MN regional publications, i.e. Barnes and Noble, Beyond Shinders, Target, etc. As always remember to Stay Looking Cute! Posted in News, Products | Comments Off on Extra! Extra! Read All About it! Can I Get An Upgrade! Okay, so that is not our favorite song, but it is appropriate in this situation. The SoHo Exchange website is going through some maintenance, updating software, slightly new design and other computer stuff that I don’t understand, but luckily our Webmaster does! If you have questions, please give us a call 612.578.2588 or email soho[at]sohoexchange[dot]biz. Stay lookin’ cute! Posted in News | Comments Off on Can I Get An Upgrade! SoHo Exchange Now on Twitter! Are you addicted to Twitter? Now you can follow your favorite stylish site! Find us at Twitter with SoHo Exchange. As always! Stay looking cute! Posted in News | Comments Off on SoHo Exchange Now on Twitter! Subscribe to SoHo Exchange News (RSS).